Paul Ryan is the most consequential House Republican since Jack Kemp in the late 1970s, and for the same reason. Okay, I can hear the objections already—what about Newt? Yes, the Contract with America and Newt’s long-term dogged determination that Republicans could take a House majority when almost no one thought it possible deserves accolades. But Kemp and Ryan stand out for advancing serious game-changing ideas and pursuing them the with single-mindedness—in Kemp’s case, supply-side economics, which went against the grain of his own party’s establishment. In Ryan’s case, it is seriousness about restraining the welfare state, before it drags us all under. Kemp and Ryan are hedgehogs (“knowing one big thing”), while Newt is a fox (“knowing many things,” though arguably too many things). Ryan wants to have an adult conversation with America about the looming insolvency of the welfare state, and he has a serious plan to fix it. Like Kemp, lots of careerists in the GOP will head for the tall grass when the going gets tough, which I predict will begin on Tuesday afternoon, after Ryan lays out his budget proposal in more detail at a speech at my office, the American Enterprise Institute. (I’m going to be on a plane at the time and will have to miss it, but you can watch the webcast.) Ryan gave a preview of his plan yesterday on Fox News Sunday. 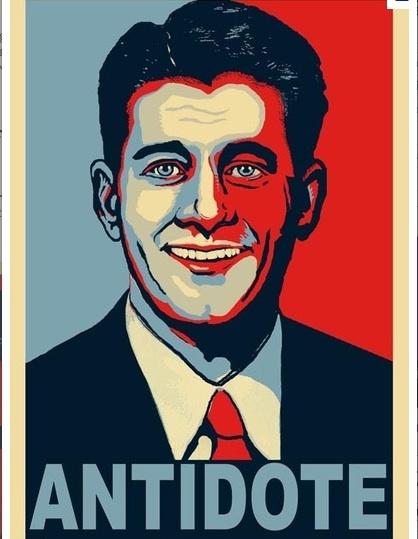 Ryan knows he will face rank demagoguery from Democrats over his plan. He is not afraid of this, and in a face-to-face right he runs circles around every single one of them. I suspect Ryan is one of the few Republicans Obama genuinely fears; after all, Ryan schooled Obama in Obama’s faux-“health care summit” early last year. (Obama does not look pleased in the video.) David Brooks reports, by the way, that Obama never picks up the phone to try to talk with Ryan. Ryan is not simply fearless about the issues, he also gets the larger picture, and can talk about the larger picture in a way that Kemp often fell short. Ask Kemp about any other question than taxes, and you’d often hear a rambling answer that tied inner city education problems to the gold standard. That’s why his presidential prospects withered. Ryan, on the other hand, has immense facility to talk about the broader principles of the republic; he’s not just a number-crunching bean counter. There are those who say modern society is too complicated for the average man or woman to deal with. This is a long-standing argument, but we heard it more frequently after the mortgage credit collapse and financial meltdown in 2008. They say we need more experts and technocrats making more of our economic decisions for us. And they argue for less “political interference” with the enlightened bureaucrats … by which they mean less objection by the people to the overregulation of society. If we choose to have a federal government that tries to solve every problem, then as long as society keeps growing more complex, government must keep on growing right along with it. The rule of law by the people must be reduced and the arbitrary discretion of experts expanded. . . If the average American can’t handle complexity in his or her own life, and only government experts can … then government must direct the average American about how to live his or her life. Freedom becomes a diminishing good. But there’s a major flaw in this “progressive’” argument, and it’s this. It assumes there must be someone or some few who do have all the knowledge and information. We just have to find, train, and hire them to run the government’s agencies. Friedrich Hayek called this collectivism’s “fatal conceit.” The idea that a few bureaucrats know what’s best for all of society, or possess more information about human wants and needs than millions of free individuals interacting in a free market is both false and arrogant. It has guided collectivists for two centuries down the road to serfdom — and the road is littered with their wrecked utopias. The plan always fails! From time to time, we have been tempted to believe that society has become too complex to be managed by self-rule, that government by an elite group is superior to government for, by, and of the people. But if no one among us is capable of governing himself, then who among us has the capacity to govern someone else? Of course, Reagan was only channeling Thomas Jefferson, who had said in his first inaugural address: “Sometimes it is said that man can not be trusted with the government of himself. Can he, then, be trusted with the government of others? Or have we found angels in the forms of kings to govern him? Let history answer this question.” Find me a single Democrat who talks like that today. Anywhere. All of this raises the important question: Should Ryan run for President? Right now everyone is saying the Republican field is “lackluster” or boring. I don’t happen to agree. I’m a fan of both Pawlenty and Daniels. (I’ve seen Pawlenty in person lately and thought he was quite good, and getting better by the day.) But to the extent there is any truth to this, Ryan looks like the one person who could electrify the Republican electorate, appeal to independent voters, and sustain an argument against Obama that would make for a decisive election. Ryan is young, has young children, and has lots of reasons to wait. But one can’t choose one’s moments in politics. I can imagine a set of circumstances in which his budget proposal gets little traction against White House intransigence, and by the fall the political winds are such that entering the race makes so much sense that he has to do it. POSTSCRIPT, August 16: Whether Ryan runs or not, Power Line readers in southern Califonia should mark their calendars for November 12, when our friends at the Claremont Institute will be presenting Ryan with with their statesmanship award at their annual dinner to honor Churchill . Sign up!